How do I make a reservation?The reservation is done online by going to the booking system (Book Now). You will receive an email confirmation as soon as you book the rental or service. You will have an option to pay by credit card (Paypal) at the check out or you can pay cash at the time of delivery. You will be contacted by email or by phone the day before the event or party about the delivery time frame. How far in advance can I reserve my Bounce House or any other rental? The earlier you can make your reservation the better your chance at getting the date you want. We appreciate as much advance notice as possible, but we will always work with you even if it's a last-minute request. What is your delivery area? We deliver to Dixon, Vacaville, Fairfield, Suisun City, Napa, American Canyon, Vallejo, and Benicia, CA for jumper rentals.There are minimal delivery rates depending on what city you are in (distance). We service the bay area and sacramento area for the entertainment services. What is the Bounce around Jumpers policy on inclement weather? If the weather is not cooperating on the day of your reservation we will be happy to work with you to reschedule your reservation with no cost or penalty. As a safety precaution, if it is actively raining or storming we will not deliver or setup the unit. Once the unit is set up we will be unable to provide any reimbursement or refund for bad weather. We will work with you the day of your rental if threatening weather is present or approaching. Do I need to provide anything or do anything special? We will provide and set up all necessary equipment. The blower motor will need to be located within 50 feet of a standard electrical outlet. An area that has been cleared of any debris or pet droppings will keep the setup process quick and efficient. Please provide an extension cord if available. What should I expect on the day of the party? How does the process work? We will deliver and set up the unit at a prearranged time. Before and during setup we will discuss placement options for the unit, review the rental agreement, and go over any questions regarding safety, proper use, and any other topic you wish to discuss. If payment has not already been made, it will be due in cash upon setup of the unit. Do I have to sign a contract? Yes! Our contract is standard for the industry and must be signed before the unit is set up. Where can I have the Bounce houses setup? A Bounce house can be set up in many different places on your property. The surface must be relatively firm - grass, concrete, asphalt, and smooth gravel are all acceptable. We will anchor the unit either by driving stakes into the ground or by using sandbags where stakes cannot be used. How much space is required for setup and proper use of the Bounce house? 16' x 16' is more than big enough for the standard Bounce house. Slides require 25 feet by 15 feet. Combos require 20 feet by 15 feet. Will you come and break down the bounce houses? Yes. The same driver who delivered the inflatable bounce will come and break down the bounce house, and generally takes 20-30 minutes. Please do not release the unit to anyone else, unless you’ve received specific instructions from the original driver. How safe are your Bounce houses? All of our Bounce houses are new, clean, and well maintained. It will be necessary for an adult to be in direct supervision of jumpers at all times. By following basic rules all children will be safe and have a great time. There should ALWAYS be someone supervising any inflatable. The most important duties of an attendant are limiting the number of children in or on the inflatable at one time, making sure that the children are all of similar size and controlling the behavior of all participants. If you need an attendant, we may be able to provide one for an hourly rate of $15 per hour. As the renter of the bounce house, what are my responsibilities? While the unit is in use, a responsible adult must be assigned to supervise the children. The adult must know all the bounce house safety rules written in the contract, and also enforce these rules. The renter is responsible for the safety of the children, as well as the care of the inflatable bounce unit. What happens if I need to cancel or reschedule my reservation?Simply send us an email the day before the party date. If you need to reschedule your reservation we will work with you to choose another day. We do request that you provide us with as much advance notice as possible. The sooner we know about the need to reschedule the more flexible we can be. Is a deposit required to reserve your date? No. All you need to do is to fill out the reservation form in our website. Can I use a Bounce house at a park? Yes, if the city where the party is going to be held allows a bounce house at their parks. Are there any cleaning fees? We expect to receive our inflatables back in a fairly clean condition. We realize that children in and out of it all day, can allow grass to enter by means of their socks. We will not charge for cleaning this. However, since you will receive a list of general rules at the time of setup, any mud, food, drinks, water, silly strings, stickers, candy stains, wrappers and confetti or not following any other listed rule of this nature will result in a minimum $30.00 clean-up fee at the time of pickup. The inflatable will be inspected before its packed up at your location. How much should I pay for a bounce house or inflatable? It depends. You get what you pay for - Cheap inflatables cost less and therefore are rented for less. The higher quality inflatables with the latest safety features and better bounce cost more and therefore cost more to rent. If you want the convenience of having someone deliver, setup, give instruction, and remove the inflatable, you will pay more. If you don't mind giving up your time, effort and gas, there are rental companies that allow the customer to pick up inflatables in their own vehicle, set it up, take it down, fold it up, and drive it back - you will save around $20. Are the bounce houses clean? Yes, We pride ourselves on having clean and sanitized equipment. 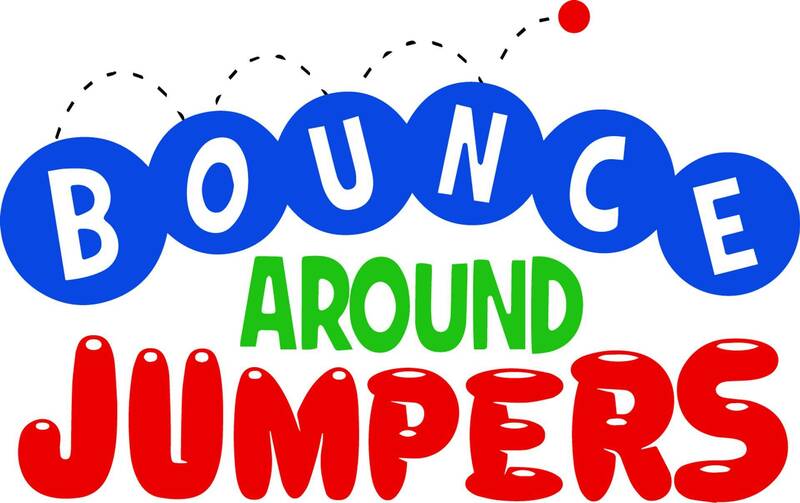 Does Bounce around Jumpers have a business license? Yes! We are licensed. Does Bounce around Jumpers have an insurance? Yes! We are covered with a liablility insurance. What are the rules when using a bounce house or inflatable?Generally speaking, no food or drink, no shoes, no sharp objects, no visible metal zippers, no medical conditions including pregnancy, no wresting/roughhousing, no hanging on the netting, no flips, NO SILLY STRING and NO Sand. What do we do if the inflatable is up and it begins to rain? Unplug the blower and move it out of the rain while you let the inflatable deflate. Once the rain stops, plug the blower back in and wipe down any wet surfaces to avoid slipping. The vinyl gets very slippery when wet. The kids just want to have fun they do not care if it just rained. What methods of payment do you accept for rental items?Currently we accept Paypal (Visa, Mastercard) when you book your rental or service online. We accept cash at the time of delivery. No Checks! What time will the rental equipment arrive at my location?Our NORMAL delivery times are 7-11 am. This is our NORMAL delivery window and is not guaranteed in any way. However, if we do realize that we will be later than 11:00am, we will try to call and let each customer know as well as to find out what time their particular party starts so that we can try to get to that particular location before the party begins. We normally send an email to our clients a couple of days before the party date to let them know what time frame we will drop off the bounce house. When do I have to pay for the rental of the equipment?Payment in cash is due in full at the time of delivery of the rental equipment. Paypal payment should be received at least one day before the party date. My question is not addressed in this FAQ page, what should I do?Please contact 707-315-0549 and leave a message. Someone will contact you within a day to address your question(s).